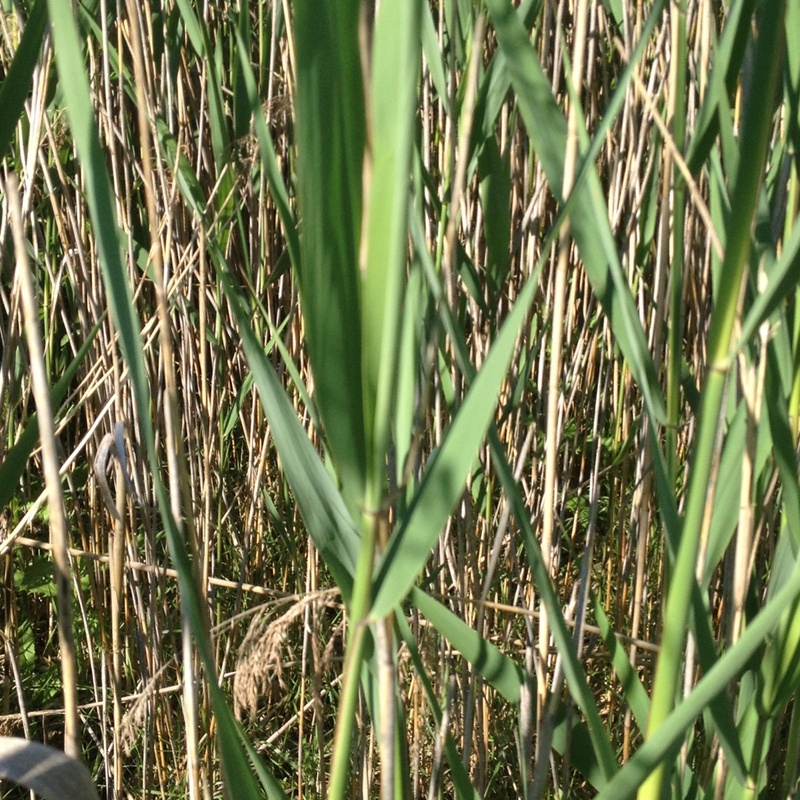 Are you concerned that you may have the wrong plant for crowd-mapping invasive phragmites when using the Phragspotter™ App? Or even scarier – are you frightened you have invasive Phragmites australis on your property or invading an area you really care about? 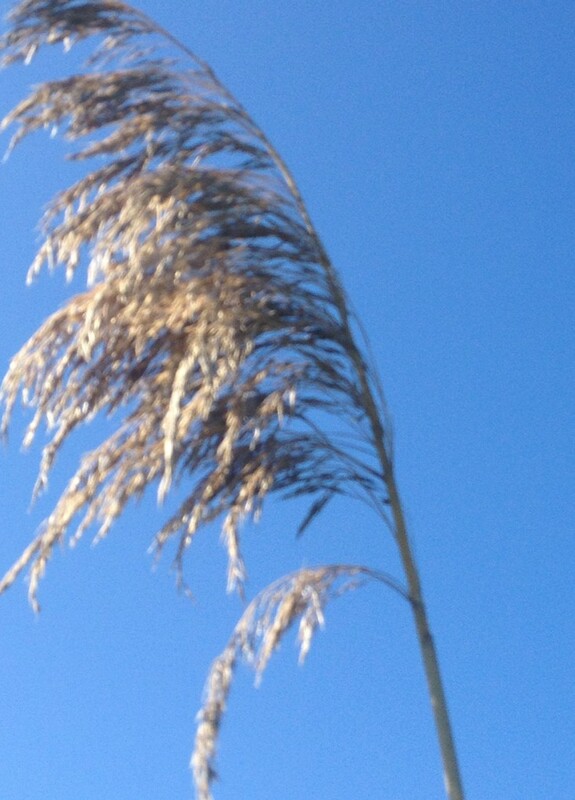 Here are some tips I’ve collected to help you identify the invasive Phragmites australis subsp. australis. 2. 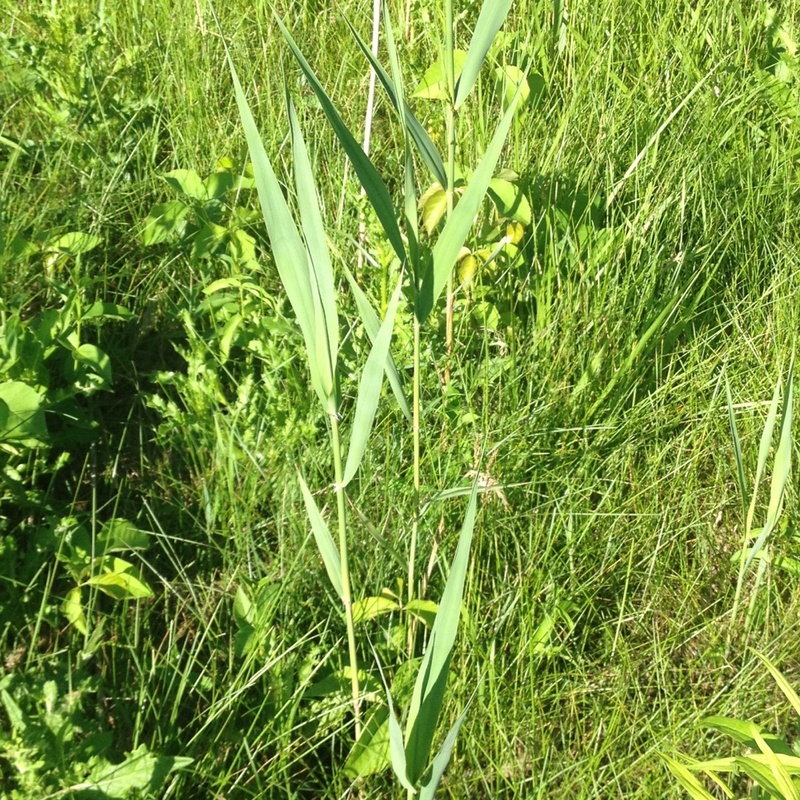 Dead stems and new growth on invasive Phragmites are often found together as dead stems can comprise a high percentage of a stand. Here are pictures of a more established larger mono-stand and an evening picture of a smaller stand that will grow denser with time. 3. 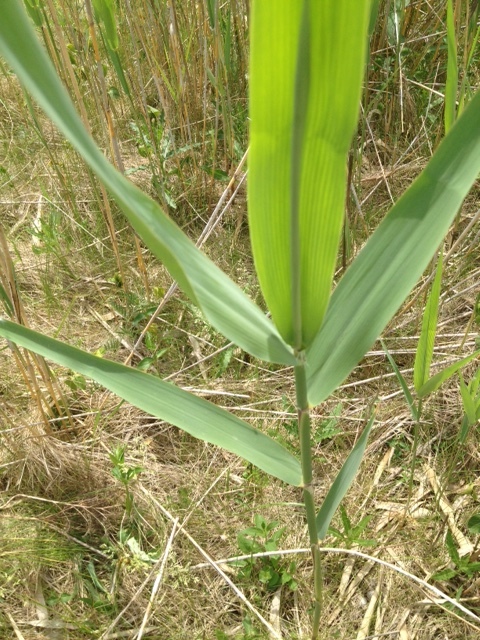 Leaves of growing invasive Phragmites plants are green, with a blue-grey cast. I like Cameron Wood’s descriptions of these plants, as narrow longish triangles that can look a lot like cornstalks without the corn. 4. Seedheads on invasive Phragmites are quite robust. In early July to August, the seedheads have a purplish tinge to them. Since the flowering season has not fully arrived, my pictures below show a seedhead on a dormant stem and one from June – you can visit the Wisconsin Horticulture site for a great picture of a flowering (purplish) seedhead. Note – Young Plants may not generate seedheads the first few years. 5. The base of stems on invasive Phragmites are tan coloured and rigid. Growing Phragmites have sturdy greenish stems that seem to have small discoloured regular breaks with dark rings reminiscent of green bamboo. 6. 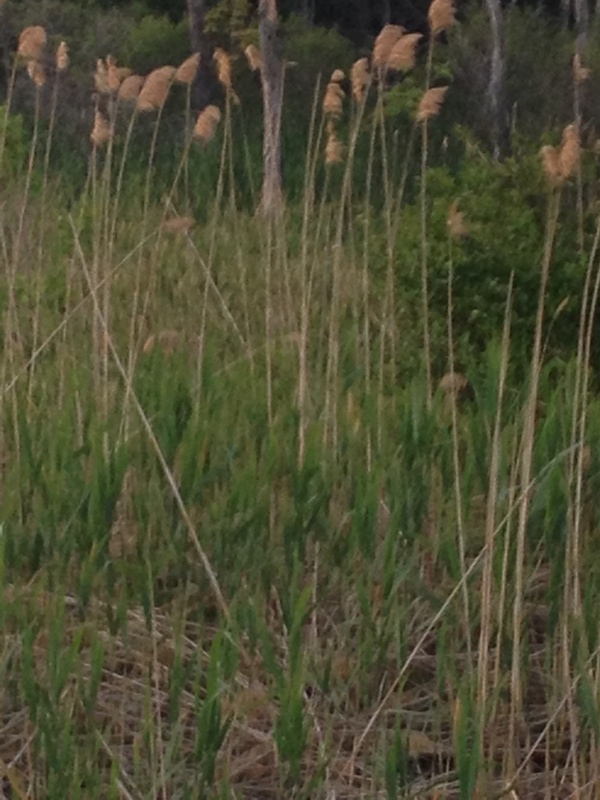 Rhizomes (and stolons) of invasive Phragmites are the below and above ground creepers that help the plant spread. New plants start sending out tendril-like horizontal limbs called rhizomes and stolons that develop new shoots every 30 to 40 cm. Stolons can grow as much as 43 feet and can have reddish colour; while rhizomes can extend as much as 70 ft. Rhizomes are particularly effective spreaders since they ‘travel’ underground and severed parts of rhizomes can live and thrive independently starting new stands. See a picture of stolons by visiting this page from the Michigan State University Extension under the paragraph about reproduction. Phragmites pose the biggest threat to biodiversity in wetlands, but they can also thrive and be found in many other environments. The biggest spread vector in my opinion seem to be ditches or culverts beside highways and roads like the stands slinking up the 400 from Toronto. 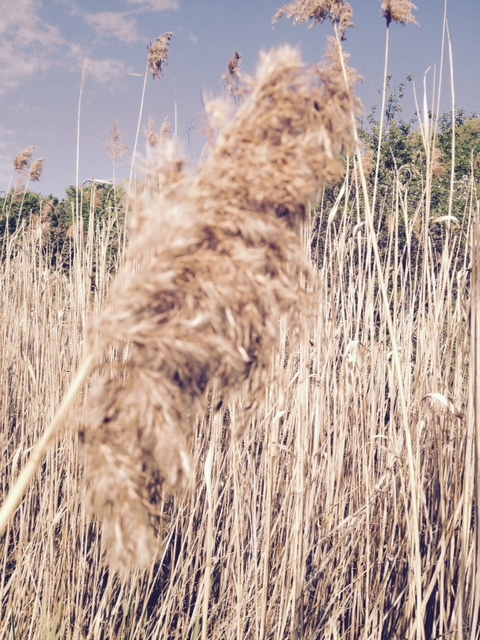 Beaches – the density and height of Phragmites stands is an issue for water access. See next point. Dry or pebbly shores – no approved chemical treatment in Ontario for near water or water use. 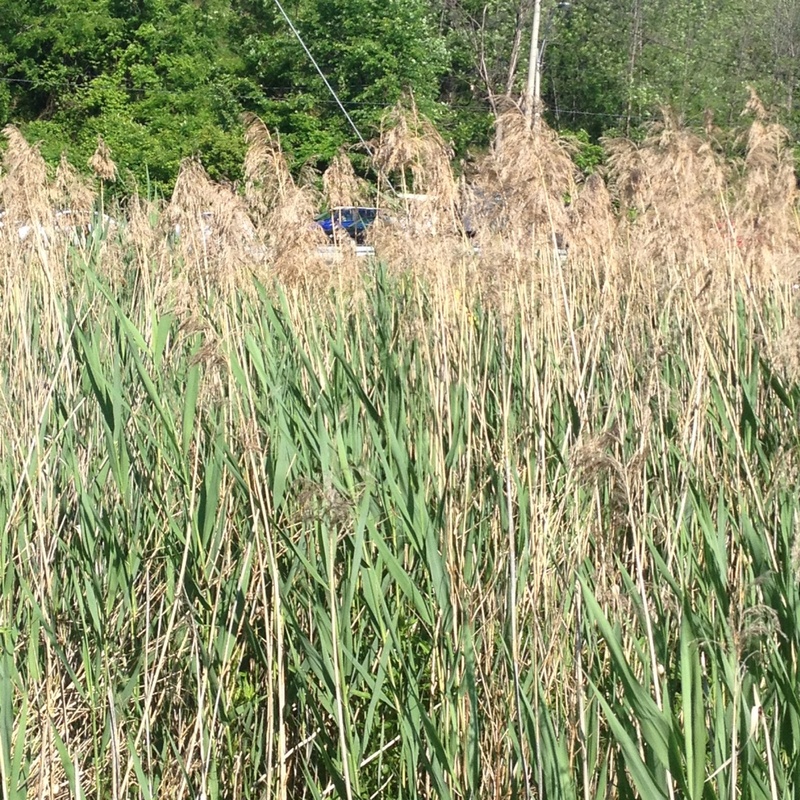 Invasive Phragmites that manifest themselves in these areas are labour intensive to remove. Along rivers and in shallow still water – previous 2 points apply. 7. 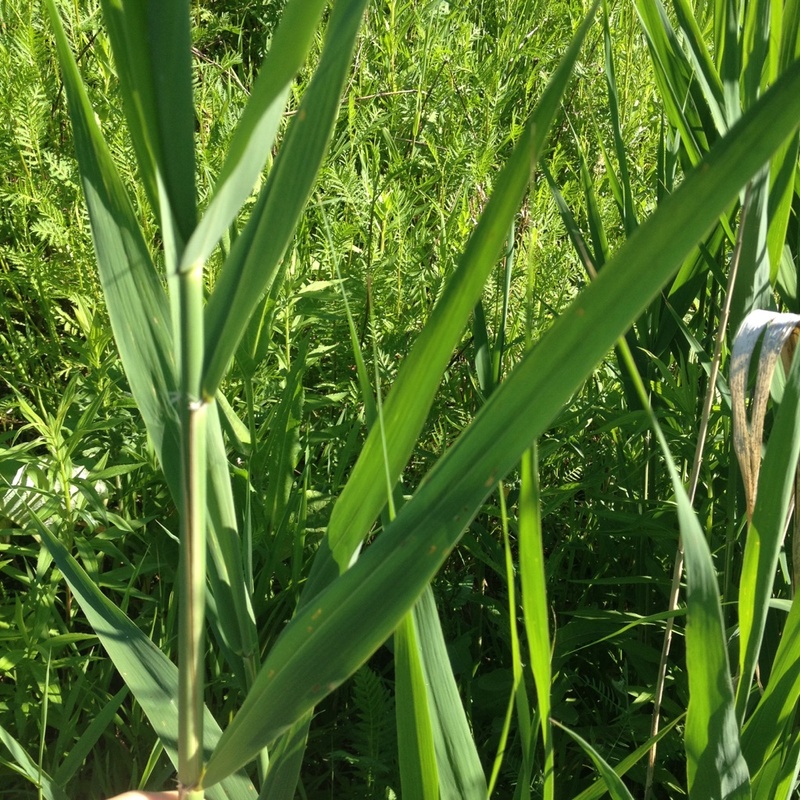 Young invasive Phragmites can be difficult to pinpoint. They aren’t always with a bunch of dead stems, and they can be more sparsely distributed until the plant stand becomes established. Being young, the plants are smaller but grow quickly and may not flower or produce legitimate seeds for a couple of years. Do what you can to be very observant, as catching Phrag at the early stages is easier and less costly to put a plan in to control. Lets “App it, Mapit, and Zap it” – the strategy devised by stoptheinvasion.ca. If you have any pictures you want to share of native or non-native Phragmites, please contact me at bywiringup@gmail.com. See you on The Bay, Heather Sargeant. Moos, Rob. The Georgian Bay Association: Phragmites Fact Sheet. The Georgian Bay Association, April 25, 2015. This entry was posted in Why should I care? 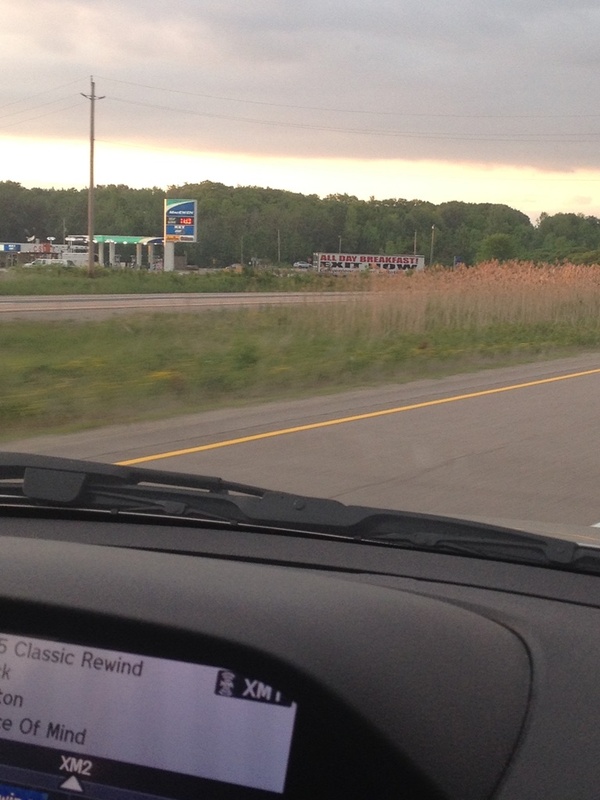 and tagged cottage, invasive phragmites, Invasive species, Phragmites on June 19, 2015 by wiringup. In the Phragmites ‘Dead Zone’. Not much can live in here.